Zvishavane District Administrator (DA) Shepherd Marweyi has been arrested on allegations of corruption and abuse of office in a case related to dubious land deals in the town and elsewhere. Midlands provincial police spokesperson Inspector Ethel Mukwende said Marweyi appeared in court for a routine hearing on a case she, however, was not willing to disclose. "It was a routine hearing for a case that is already there. You can find-out at the court what the case is all about," said Mukwende. Sources, however, said Marweyi was fingered in fraudulent land deals done in conjunction with a named land development company linked to a former senior manager in the town council. The land in question are stands at Mabhula in Maglas, Chiraya stands in Isiah Park and the Kosvoro and Mutonjeni stands located five kilometers along the Gweru -Zvishavane highway. 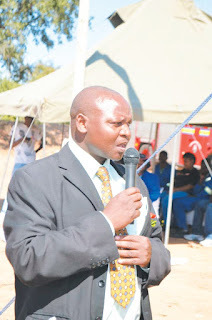 …'net closing in on corrupt Zvishavane town managers'the Mabhula stands in exchange for the ground at Mandava turnoff from Masvingo road where he wanted to build a fuel station. Marweyi's case comes two days after the arrest of Kasukuwere in connection with other dodgy land deals in Harare. It also comes a week after a two-day visit by new Local Government minister July Moyo, Minister of State for Midlands Provincial Affairs, Larry Mavhima and Mines and Mining Development minister, Winston Chitando on September 20. Sources revealed that the net was also slowly but surely closing in on some senior members of the Zvishavane town council management who are suspected of enormously benefited from corrupt land deals.